Preheat oven to 325°F. Line both sides of a giant donut pan or a smooth Bundt pan. 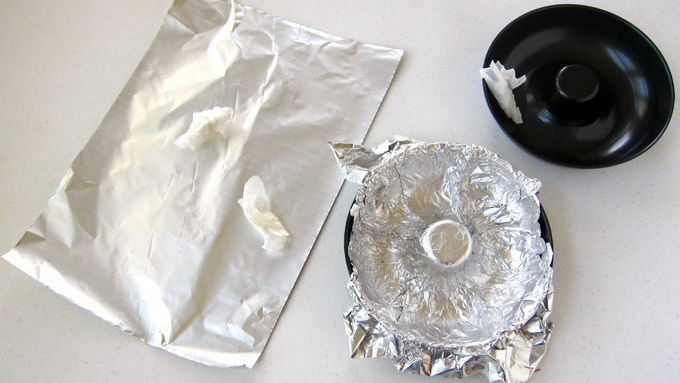 with non-stick tin foil, allowing the edges of the foil to extend above the edges of the pan. In areas where the foil does not extend past the pan, add pieces of foil so that it extends at least one inch above the edge of the pan. 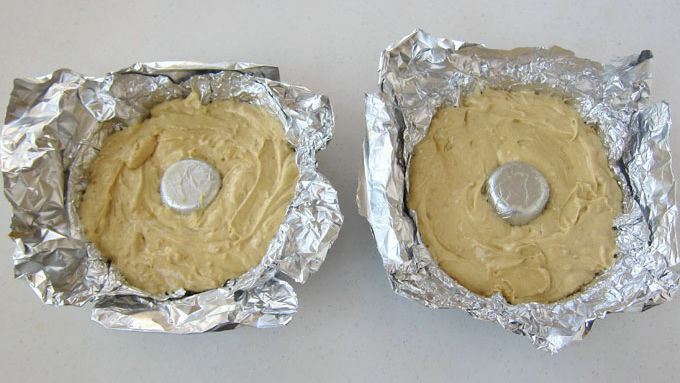 To give the cakes that cracked look of the original cookie, you'll want to leave all the wrinkles in the foil. 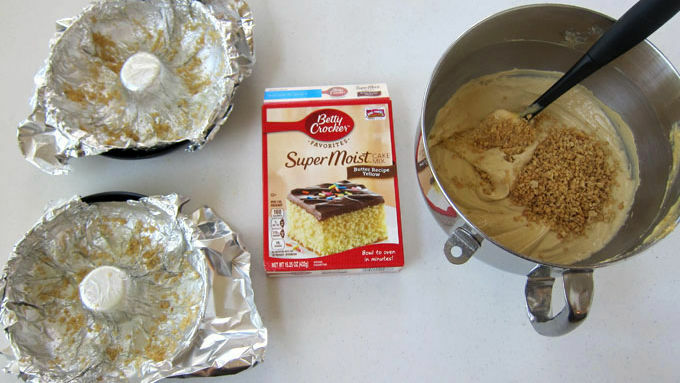 Add pieces of bunched up parchment paper under the foil to create mounds that will look like cracks in the cakes. Combine the cake mix, 2 tablespoons of brown sugar, softened butter, and peanut butter in a mixing bowl. Beat on low speed using an electric mixer until combined. Add the water, sour cream and eggs and beat on low speed just to combine, then on medium speed for 2 minutes. Stir in the finely chopped peanuts. Spray the tin foil-lined pans with baking spray and sprinkle the remaining tablespoon of brown sugar over the pans, evenly distributing it over the entire surface of the pans. Equally divide cake batter among pans. Bake for 40-46 minutes until a toothpick inserted into the center of the cakes comes out clean. Cool cakes in pan for 10 minutes. Then turn them out onto a cooling rack and peel off the foil. 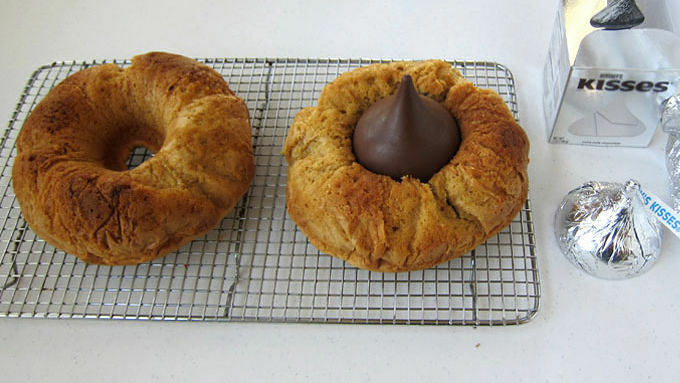 Immediately set a giant chocolate kiss in the center of each of the cakes. Optional Peanut Butter Glaze: Stir peanut butter, frosting and heavy whipping cream together in a microwave-safe bowl. Just before serving heat for 15-second increments on high, stirring after each, until thin enough to pour. Cut cake and drizzle glaze over top of slices. 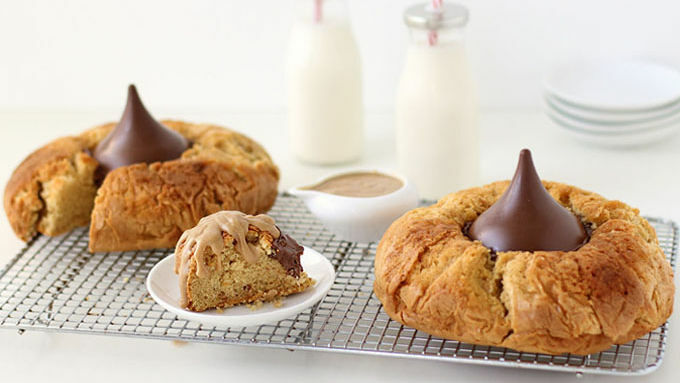 These peanut butter cakes are topped with giant chocolate kisses for a fun and tasty twist. These are not cookies. 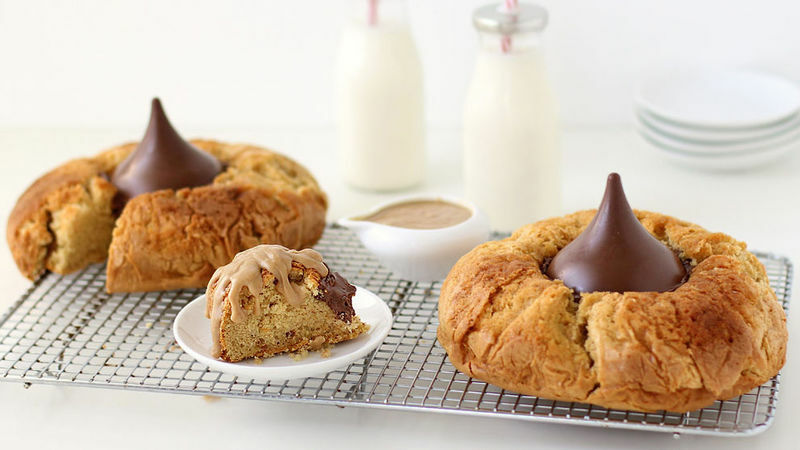 They might look like the popular peanut butter cookies topped with a chocolate kiss, but they’re not. These are giant versions made with peanut butter cake and they taste incredibly similar to the original. Made with giant 7-ounce chocolate kisses in the center of the cake, this unique dessert will feed a hungry crowd at the holidays—or any day. Imagine walking into your cookie exchange this year with these cakes in hand. Your friends will freak! The cakes taste amazing plain, but you can dress them up by spooning some peanut butter glaze over the top.